I learned this recipe when I was 15 years old on an exchange to the Netherlands. My host mama, happened to be Spanish and I got a bonus food and cultural experience from it! She made many delicious things during my time there, yet for some reason this simple dish was my all time favourite. I will never be able to make it quite like her and have been through many failed attempts with lots of egg and potato on the floor. Years later I finally have it together and it has become my go to dish when there is supposedly “nothing to eat.” We almost always have potatoes, eggs and onion in the house. Many people would not see this as a full meal but the combinations are endless. According to Stats Can, other than “non-alcoholic beverages and other food products,” the average Canadian household spends the most on, dairy products, eggs and meat. While many people are working to eliminate many of these things from their diet in favour of a more plant based approach, eggs and meat are a large part of my food culture. Many alternatives are not grown locally and in my quest to eat as locally as possible, eggs and meat will remain a source of nutrition for me. The Spanish Tortilla a dish that requires little and provides a lot for our bodies. I am in love with cured meats and if I happen to have a little chunk left in the refrigerator, I will add it diced up in this dish, similar to how my exchange mama added diced pancetta like meat to hers. Next time you think there is nothing to eat check for these few ingredients and you may find yourself with a delicious meal. 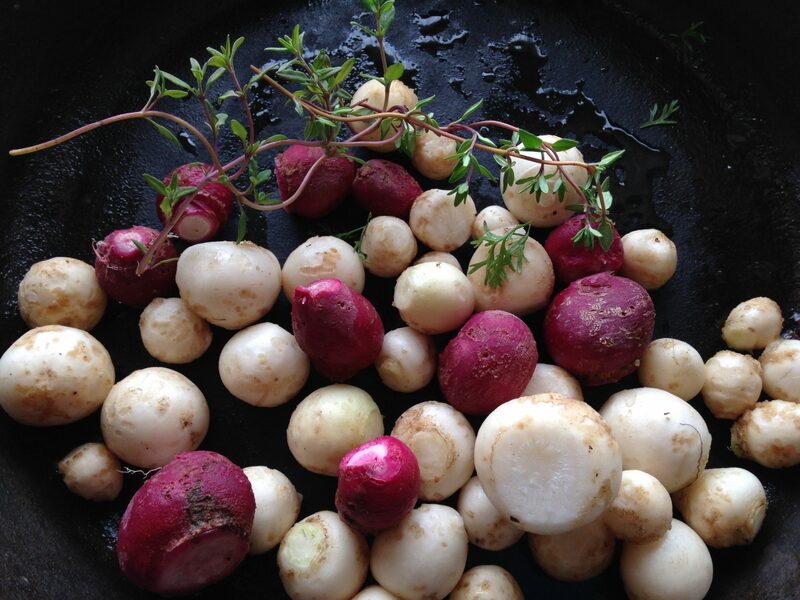 Tip 1: Small potatoes and fresh potatoes that have not been stored have a more tender skin. You can decide based on the potatoes you are using if you would like to peel them. Slice potatoes, about 1/2 cm thick. If you are using large potatoes cut them so they are about the size of coin. I used baby potatoes for the tortilla in the picture. Tip 2: If using raw bacon, sauté in pan first so that it is partially cooked, leave bacon grease in and add raw sliced onion and finish sautéing together. If using cooked bacon or cured meat, sauté with sliced onion in olive oil until onions are soft. Add sliced potatoes to pan. Let potatoes become coated in oil so that they can absorb the flavour. Add half the salt salt and stir in until potatoes become slightly browned. Break 6 eggs into a separate bowl and beat with fork or whisk as if you were to make an omelette. Add the rest of the salt and some pepper. Dump potato and onion mixture into the bowl with eggs. Gently stir together and pour back into cast iron pan. Make sure there is still enough grease on the pan so it won’t stick. Cover with lid. Turn the heat down on the stove and let bake. If your stove has very high concentrated heat, you may turn the stove off and the residual heat in the pan and potatoes will also bake it, just at a slower pace. On a low heat or with the burner completely off, the tortilla should be done in about 10-15 min. Tip 3: If you do not have a pan that holds heat, such as a cast iron pan you can choose to bake the dish in the oven instead. Simply grease a casserole dish and pour the potato and egg mixture into it. Bake uncovered at 350 for about 10-15 min or until the centre is no longer runny. Previous PostPrevious Local for Less?